Clyde Hoch's memoir, Tracks: Memoirs of a Vietnam Veteran, takes the reader through enlistment, boot camp, training, missions and returning home. Clyde Hoch of C Company, First Tank Battalion, First Marine Division, Fleet Marine Force, served in Vietnam for a little over a year in the late 1960s. I was particularly moved as he described the children he saw in Vietnan, and especially the two that touched his heart. Before he was deployed to war he was sent on a Med Cruise mission to the Mediterranean where he discovered what poverty truly looks like. He realized he had no idea of what hunger really is as he watched the people rush to garbage barge and eat the discarded food. He also shares his memories of boot camp, the drill instructors, and how the recruits were denigrated with name calling and constant punishment for the simplest infraction. He and a few of his friends had decided to become Marines, but Clyde was the only one who followed through. I respect and admire those who have and currently are serving in the military to protect our country. One of things that stands out in this memoir is Clyde Hoch's attitude. He shares some horrific memories but does so in a calm and respectful way. I learned so much about the military that I never could have imagined. Author Clyde Hoch kept his story light but honest, and brought his experiences to life in vivid detail. Not all vets are willing to share their experiences and I am glad Clyde chose to share his. 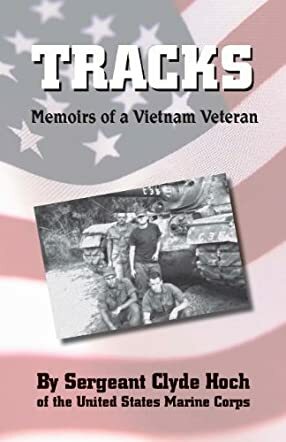 Tracks: Memoirs of a Vietnam Veteran is an emotional and interesting memoir that I recommend to anyone interested in this critical era of American history.